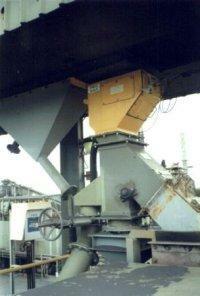 The Series 3A impact weigher (shown in yellow) uses a single impact sensing plate to intercept all the mineral being discharged from a conveyor into a storage silo prior to despatch by rail. A built-in sampler allows a small sample of production to be obtained over the production period that is representative of the mineral that has been produced. Accuracy + or – 0.5% of true weight. Capacity Up to 100 tonnes per hour. Power Supply 110/220/240 Vac, 50Hz. Measurements Mass flow rate; Batch weight; Total weight. Outputs 4 to 20 mA; 0-5 Vdc; pulses per tonne; RS232C or RS485. Production statistics Min/Max/Average flow rates over the period.